With over 33 years of experience and training in therapeutic massage, movement arts, holistic health, and mindbody medicine, Liesl brings a multidimensional approach to the table during her integrated, intuitive bodywork sessions. Her intention as a therapist is to listen to the body’s innate wisdom, and follow wherever it leads. 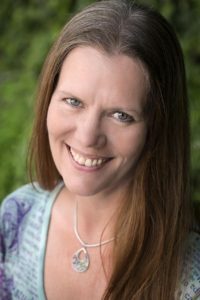 Liesl is passionate about helping people to experience deep relaxation, peace, and radiant wellbeing through the healing power of touch with presence. Liesl graduated from Mark F. Beck’s Magic Valley Massotherapy Institute in 1983, and has continued to explore cutting edge healing arts ever since. Her eclectic background includes Swedish massage, deep tissue, myofascial release, lymphatic, acupressure, Lomi Lomi Nui, Cranial Sacral Therapy, Soft Tissue Mobilization, Positional Release, Anatomy Trains, Structural-Muscular Balancing, Orgodynamics, Reflexology, biofeedback, microcurrent therapy, sound frequency healing, hypnosis, breathwork, guided visualization, meditation, yoga, tai chi, qigong, dance, and a variety of energy medicine modalities. Liesl has also developed several modalities of her own, including Resonant Point Unwinding, which dovetails beautifully with Neuromassage. The combination of deep, slow myofascial-energy bodywork with biofeedback training helps the nervous system discharge patterns of guarding and restriction, and reset the pain threshold, which has often become hypersensitive due to trauma, chronic pain, stress and disease. Liesl especially appreciates how Neuromassage engages the subconsciousness in a dynamic dialog whereby both the client and practitioner are learning, in the moment, what effectively lowers stress and tension, and creates a sense of safety. This encourages the body to more rapidly “re-member” its natural state of ease, equilibrium and coherence. In addition to her life long love of the healing arts, Liesl is a singer, composer, artist, poet, videographer, designer, gardener, foodie, sci-fi geek, costumer, mother, avid beach bum and frisbee player.